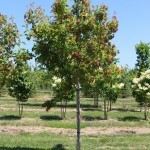 A small upright spreading tree with dark green foliage. 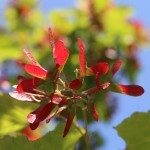 Small yellow flowers are followed by scarlet-red samaras in summer. The fall foliage changes from yellow to orange red. Grown both as a single and multi-trunk. It has strong branch unions making it less prone to storm damage. 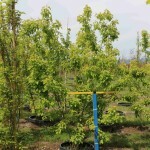 Prefers full sun to filtered sun, and tolerant of many soil types. Introduced by Plant Select®. PP 15, 023.